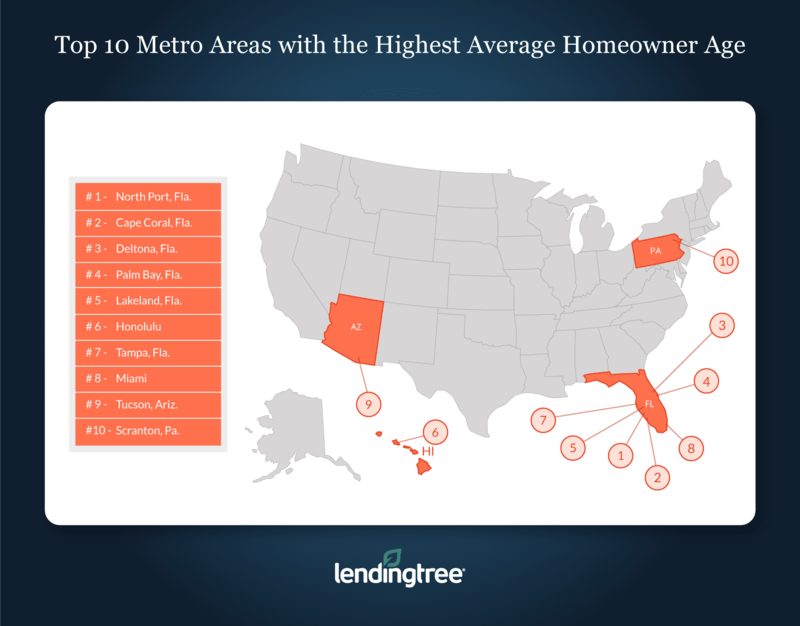 The average age of a homeowner living in the largest metropolitan areas in the U.S. is 54, according to a new study by LendingTree. Of all 50 states, Florida had the greatest number of older homeowners, with North Port, Cape Coral and Deltona topping the list with an average age of 63.3, 61.5 and 60.2, respectively. Buffalo, New York, and three cities in Pennsylvania also made the top 10. Conversely, Utah had the greatest number of younger homeowners, with an average age of 47 in Provo. The report ranked the 100 largest cities by average homeowner age using data from the Census Bureau’s American Community Survey, which collected information on households from 2012-2016 in more than 300 metropolitan areas.